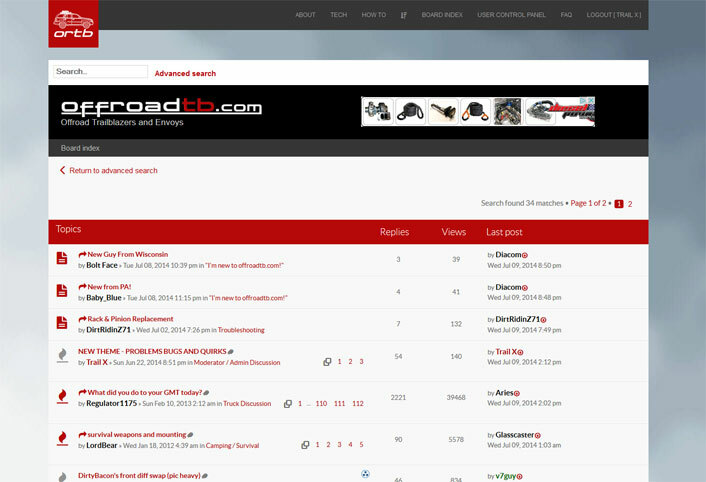 offroadTB.com • View topic - What's in the works for ORTB? What's in the works for ORTB? Well guys, I mainly wanted to post this in order to get myself in gear and force myself to get this new forum theme finally completed. It's been at least a year in the making, beginning with testing multiple forum theme options, and it really kicked into gear in the past 3 months after we chose a theme, and have begun customizing it for our needs. The new forum will be completely compatible with all screen sizes. So if you're on your PC, it will look right. If you're on your mobile phone, it will automatically configure itself so that you will be able to see everything without having to pinch the screen and zoom in to read text. I've been using it for a little over a month now and am really enjoying it so far. I have some more customization work that needs to take place, but my hopes is to get the new theme implemented on the forum in August. Then comes phase 2... implementing the theme on the www side of the site. Who knows how long that will take! Anyways, I wanted to give you guys a little peek into the future, just to get some excitement going. If you have any thoughts or opinions on it at all, please feel free to post up. I'll also need some Beta testers soon, so if you're interested, make a note of that here too. Re: What's in the works for ORTB? Looks great JD! I'd assume the new site will have proper mobile access and Tapatalk support will no longer be needed once up and working? Tapatalk it ok for basic reading but it lacks a lot of site features which annoy's me some of the time. I'd be willing to help test things if a new guy with just over a year of time here qualifies . . Essentially true about tapatalk. Tapatalk was never an optimal solution, in my mind, since as you said, so much information is left out and inaccessable. Also, the advertisements inside tapatalk do not benefit ORTB, they benefit tapatalk only. For now, the site seems to remain compatible with tapatalk with the new theme, but I'm not sure what will happen once we fully go live. They require a tapatalk 'mobile ad' to display on the header of the website when it's viewed by a mobile phone. The new site will not have that, so if they continue to check the site for that code, well, we will just have to lose tapatalk access I guess. Looks nice and clean, I like it. We're at the point where the theme is ready for Beta testers from the public. Please let me know here if you'd like to help test the theme. If you throw your name into the hat, its possible that the next time you log in to the site, you'll be seeing the new theme without any warning. what about new members, do they automatically get the new theme or the old theme? Is there a way to give all new members the new theme? Since we are in transition they would already have it without the transition time. The Roadie wrote: Research, plan your mods, fund the plan, then GO DO THEM. THEN WHEEL IT. No way to easily give only new members the theme. They should adjust easiest though. On go-live, everyone that doesn't yet have it will get it all at once. I really like this JD!! Just quick question, BTW on my iPad looks real nice have alway like the experacne of surfing on my iPad. Anyway when a post has not been read by you is the text displayed in red? Last edited by TBYODA on Mon Jul 21, 2014 11:33 am, edited 1 time in total. The red text just indicates that the post is the one you've been sent to. This can be your own post, if you just posted it and were automatically sent to it afterwards. It can be an unread post, if you click on the "new posts" arrow from a forum view page. It can also be a particular post that someone wanted you to look at, through a link that someone posted referencing a particular post. For instance, this link: viewtopic.php?f=6&t=5405&view=unread#p107115 will bring you to Caleb's post, and it will also turn it red.